This card offers a lot of grunt for your cash, but is it too much? Can a graphics chip to be too powerful? We've been pondering that puzzle ever since AMD launched the Radeon HD 5870. The key metric here is die size which is a factor of the number and size of transistors in any given chip. For the 5870, AMD more than doubled the transistor count compared with the previous generation. So, despite a shrink from 55nm to 40nm transistors, it's a much larger and more expensive chip. The result was a launch price over £300. That's fully £100 more than the 4870's launch sticker. At the very least, this goes against the PR messaging AMD has been putting out for the last 18 months or so in which it promised to deliver maximum bang for buck in the £200-ish segment with its top single-GPU board. According to the corporate spiel, the uber high end will be covered by dual-GPU boards going forward. In that context, the 5870 feels a little overblown. Yes, it's a fabulous card capable of astonishing feats of rendering performance. But it's a big, old school bruiser in many ways. It's the longest single-GPU graphics we've ever seen. Likewise, at 241 Watts under peak load, it's a bit of a gas guzzler. That said, however big it is you can hardly call it inefficient. Nvidia's new GTX 400 series is barely any faster despite packing around 50 per cent more transistors. AMD has done a lot of work on reducing idle power consumption, too. By that metric, this is possibly the most planet-friendly high end GPU ever. But with a typical price over £300 it's simply irrelevant to the vast majority of PC enthusiasts. As for this specific HIS model, it's competitively priced compared to other 5870s but still out of reach of most mere mortals. Perverse though it sounds, it actually makes sense for those who can afford it to spend even more on a 2GB version. When AMD first released the 5800 series GPUs last autumn, they were simply the best you could buy. That hasn't really changed despite the arrival of Nvidia's mighty Fermi chip and the GTX 400 series of graphics chipsets. Yes, Nvidia's latest has the edge for performance more often than not. But while the performance gap isn't, the difference in price most certainly is. In that context, and odd though it may seem, the HIS Radeon HD 5870 is actually good value at £310. It also has the advantage of being based on AMD's proven DX11 technology. It's been on the market for much longer than Nvidia's competing DX11 architecture, making it the defacto platform for game development for over six months. Whatever shortcomings it has, therefore, by now game developers will be extremely adept at working round them. The 5870 looks like good value compared with Nvidia's new DX11 GPUs. Ironically enough, however, it's actually another member of the Radeon HD 5800 family that poses the greatest threat. In performance terms, the 5850 is close enough that we doubt you'd notice the difference in-game. That's a real problem given that its typically £80 to £90 cheaper than this HIS card. What's more, we do have doubts about AMD's hardware tessellation engine. Yes, that's a complaint that applies to all of AMD's DX11 3D chipsets. But what may be forgiveable at £125 or even £225 really stings when you've unloaded over £300 on what ought to be a flawless rendering machine. 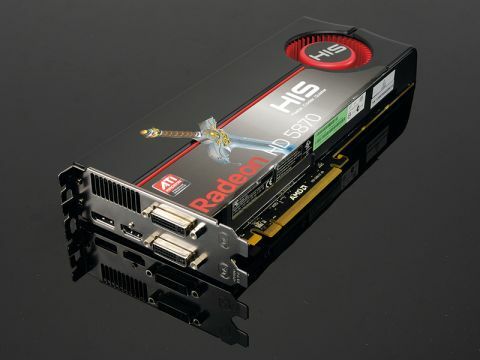 Of all the really high end GPUs, the Radeon HD 5870 remains our favourite and this HIS example is as good as any. OK, it's not the fastest graphics card you can buy. But we doubt whether anyone actually needs anything quicker. That said, we remain miffed that AMD reneged on its commitment to deliver maximum performance at the £200 price point. More to the point, six months after launch and the 5870 is still too expensive – and right in the middle of a serious economic recession. Bummer.